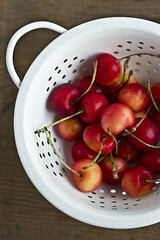 I made an online reservation for our anniversary dinner tonight at Terra Plata – a newly opened restaurant located in the south end of the Melrose Market in Capitol hill. 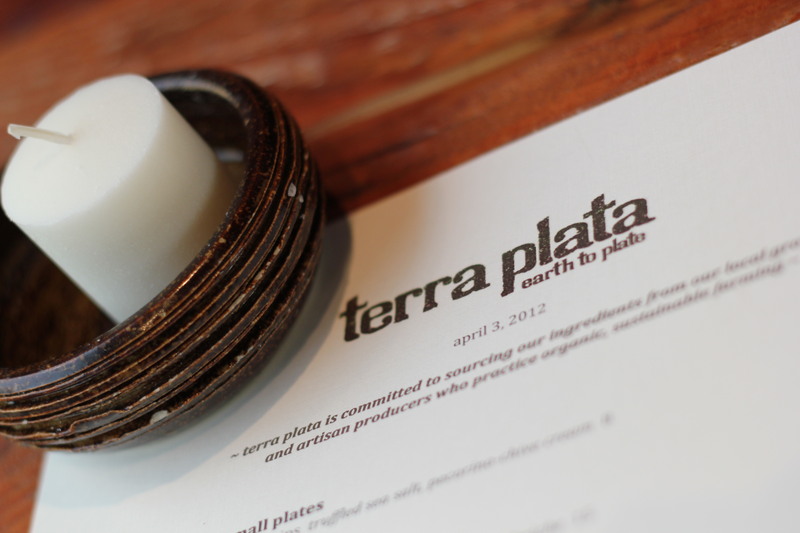 Terra plata is an “earth to plate” concept inspired by the seasons, according to it’s owner. The place is not hard to miss with it’s triangular shaped building and a tall wooden door. We went in and saw that the dining area was packed, and with a few people sitting by the window at the entry way. There was a couple of empty tables and one of them belonged to us (thank God we made a reservation). I really loved the open concept with the sliding floor-to-ceiling windows and wooden tables and chairs, not too upscale but urbane. 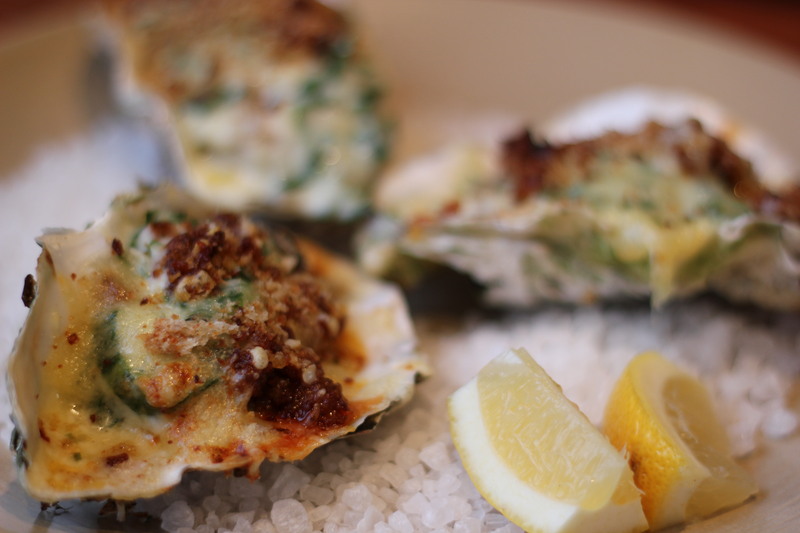 We also ordered their baked oysters and we loved them because they were topped with chorizo and creme fraiche. These oysters were settled on a bed of salt with lemon slices. 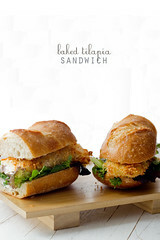 They were creamy and perfect, and we devoured them in less than 5 minutes. Then came our entrees: roast pig and buffalo burger. 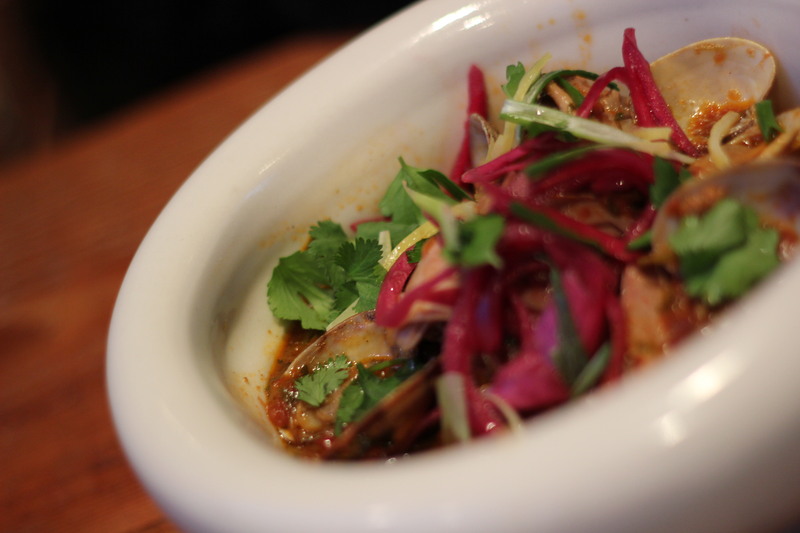 The roast pig was served in a big bowl with chorizo, clams, potatoes and chicharron. The pig was very tender and everything in the bowl just came together deliciously. This dish reminded me of home, in the Philippines, where balut vendors would sell chicharron (spelled as tsitsaron in tagalog) together with vinegar or bagoong. Roast pig is very popular in the Philippines too. We call it the “lechon” and it is usually part of any special occasions or festivities. 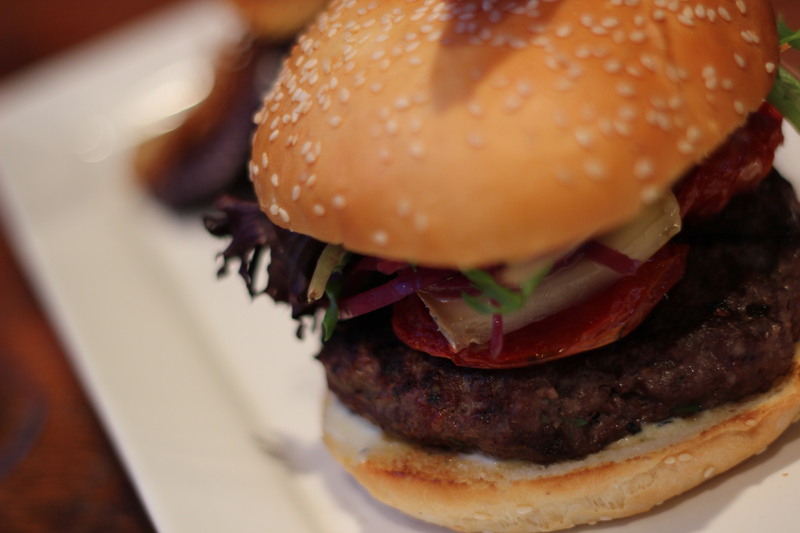 The buffalo burger was served between a tasty bun with taleggio cheese, arugula and tomato, and it came with the house made chips. I ate half and gave the other half to my husband. We both love burgers and there is one particular burger that we really REALLY love (I am not telling though) and we always compare any burger that we eat to this “Burger” that we really REALLY love. We love it that much that we almost made a reservation to that restaurant (or pub) instead. Almost. But I thought It’s always good to try something new, hence, our reservation to this new restaurant was made. And then there was dessert. 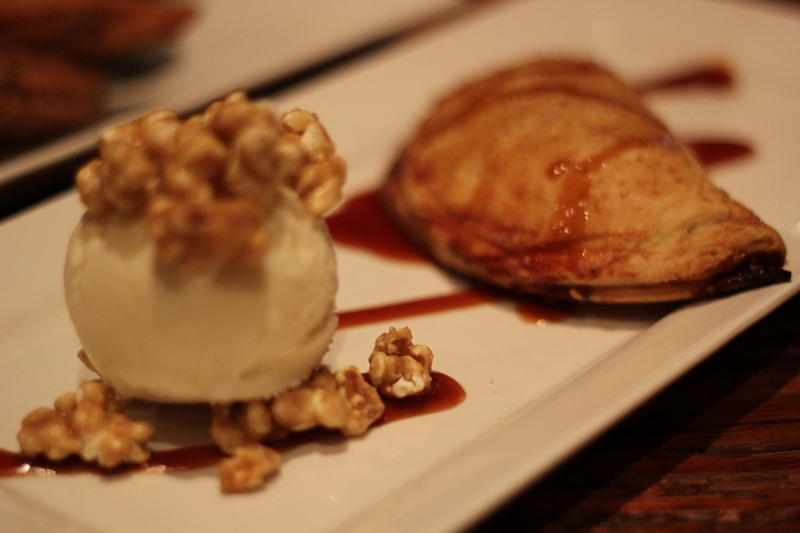 Apple empanada with cardamom ice cream and caramel popcorn, and churros with chili chocolate ganache and whipped cream. The empanada was good and the crust was flaky, but it was the ice cream and the popcorn that got our attention. We were dreaming of plans to put up a business in the Philippines and maybe we could do something with popcorn and nutella – my husband’s creative creation one night when we both craved for them. 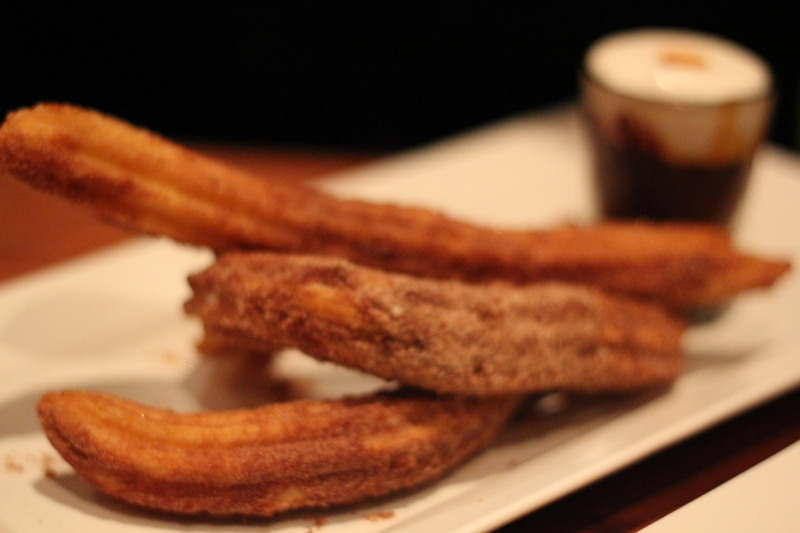 My husband loved the churros especially the chili chocolate dip, though I wish they were crispier and with less cinnamon, we still loved them. 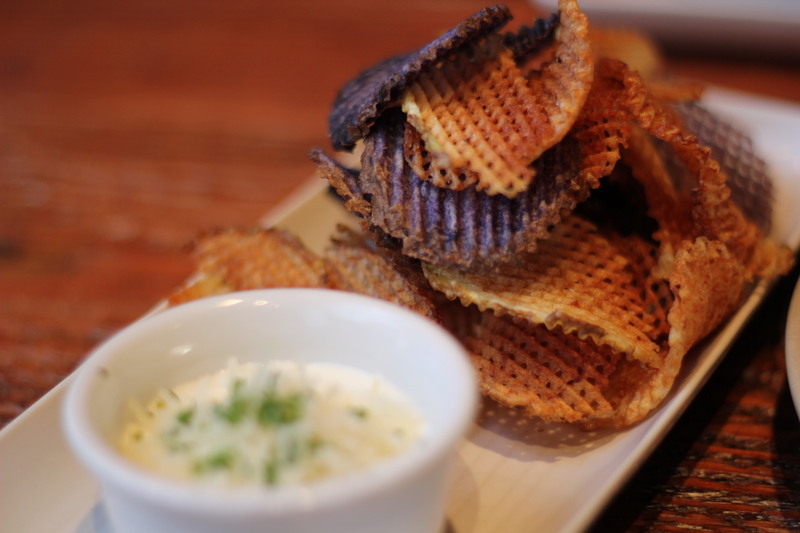 Overall, our experience was great and we even talked about coming back for more chips and churros, but when the bill came I jokingly told my husband that we will be having anchovies for dinner for the next few weeks.